The shoulder consists of the deltoid muscle. This is a large three headed triangular muscle which originates from the clavicle and the scapula at the rear of the shoulder, and extends down to its insertion in the upper arm. 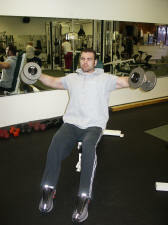 The anterior deltoid functions to lift the arm to the front (front raises, machine presses, upright rows, incline barbell and dumbbell presses). 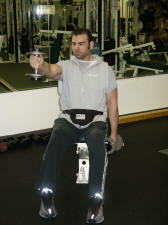 The medial deltoid lifts the arms to the side (lateral dumbbell raises). 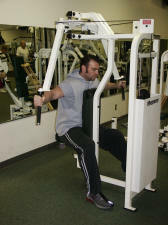 The posterior deltoid lifts the arms to the rear (bent over laterals, reverse machine fly). The trapezius is a traingular muscle which extends down from the neck, between the shoulder blades. Sit down on a bench so that your lower and upper back is supported. 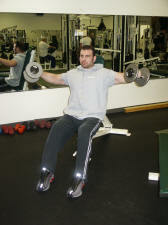 Grab two lighter dumbbells a hold them straight down at your sides. You are next going to raise your arms toward the ceiling keeping your hands elbows and shoulders all in a straight line with one another. Your elbows should not rise above your hands and your hands should not rise above your elbows. 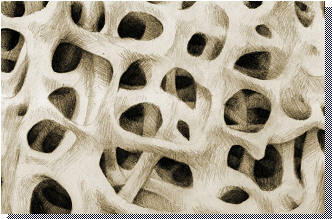 Also keep a slight bend in the elbows to take the pressure off of this joint. 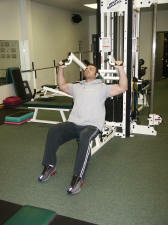 The finishing position of this exercise is when your arms are parallel to the ground. 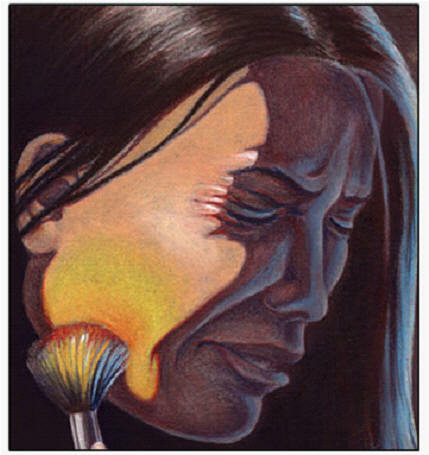 Adjust the handles so that they are just about at the level of your neck or ear. Sit down and place your lower back and upper back firmly against the seat. 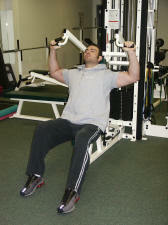 You can use two different grips on this exercise. Palms facing away from you’re body or palms facing each other. If you have had any shoulder problems I suggest use the grip where your palms face one another. 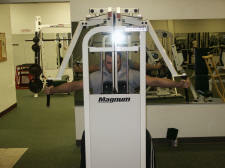 Next you will proceed to push the handles towards the ceiling until your arms are straight. 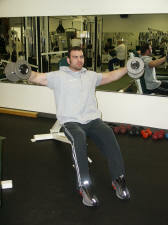 Lower the weight back to the starting position and repeat. Keep your stomach tight the whole time and don’t arch your back. 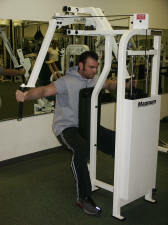 Adjust the handles so they are facing the weight stack and almost touching each other. Sit down with your chest and stomach firmly against the seat. 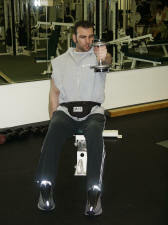 Here your grab the handles with a slight bend in the elbow and extend your arms behind you bending at the shoulder. Try not to move your elbows. You want your hands, elbows, and shoulders to all be in a straight line with each other. 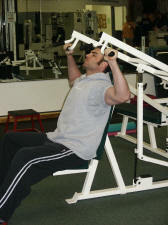 Lower the weight back down to the starting position and repeat. Sit down on a bench so that your lower back and upper back are firmly supported. 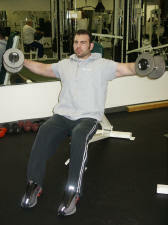 Take a light dumbbell and hold them down at your sides with your palms facing your body. 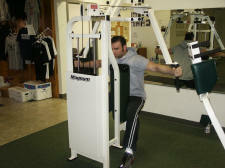 Here you will proceed to raise the weight up to a 180-degree angle and stop when your arms are at a 90-degree and to your body. Slowly lower the weight back down and repeat. This can also be done with your palms facing the ground as if you were raising the top of your hand towards the ceiling.